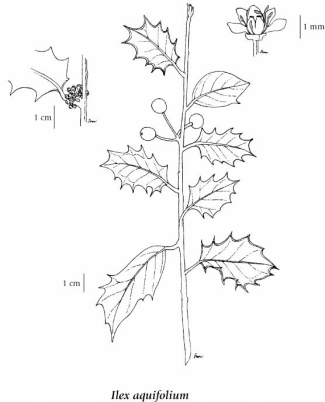 English holly is an introduced shrub or small tree species in North America that is native to western and southern Europe, northwest Africa and southwest Asia. It is widely used in garden plantings along the Pacific Coast, and is also cultivated in holly farms along the coast for the Christmas trade. It has naturalized in several US states (CA, HI, OR, WA) and two Canadian provinces (BC, ON) (USDA 2010). It is also reported from New England (Invasive Plant Atlas of the United States 2010). In BC, it is reported from the southwestern corner of the province, in the Fraser Valley and on Vancouver Island. English holly is our familiar Christmas holly, and is a readily recognized, shade-tolerant, small tree/shrub species (2-5 m in height), with distinctive, often prickly (stiff, spine-like teeth), usually dark green shiny, leathery, leaves (sometimes variegated) that may be entire to lobed. It has small white, usually dioecious, flowers in the spring, and produces bright red persistent berries. Reproduction is by both seed and suckering. This species is considered a significant urban pest, and is readily dispersed by birds into forested urban areas. It can become abundant and a significant part of the understorey/tall shrub layer--shading out native species. Seedlings are frequently encountered, both in garden settings and in natural areas. Fresh cuttings from holly trees are widely sold in BC during the Christmas period. Perennial shrub or small tree; stems erect, 2-5 m tall, branched, branchlets minute-hairy. Egg-shaped or oblong-egg-shaped, 2.5-6 cm long, entire to lobed, often with stiff spine-like teeth, shiny, evergreen, leathery. Corollas dull white, male and female often on different plants. Round, red berries, 7-8 mm wide, smooth, in clusters, persistent. Mesic forests and disturbed areas in the lowland zone; frequent in SW BC, known from SE Vancouver Island and the lower mainland; introduced from Europe. This species is listed by the Greater Vancouver Invasive Plant Council of the twelve most problematic species in the Vancouver region. For further information about control of this species, visit their web site.